T0070907 is a potent and selective PPARγ inhibitor with IC50 of 1 nM in a cell-free assay, with a >800-fold selectivity over PPARα and PPARδ. Knocking down LKB1 reversed the PPARc antagonist T0070907-induced changes in the protein expression of the M1 markers (iNOS, green) and the M2 markers (CD206, red) by immunofluorescence staining. Scale bar = 20 μm. AZ6102 is a potent TNKS1/2 inhibitor that has 100-fold selectivity against other PARP family enzymes and shows IC50 of 5 nM for Wnt pathway inhibition in DLD-1 cells. FH535 is a Wnt/β-catenin signaling inhibitor and also a dual PPARγ and PPARδ antagonist. BrdU assay was used to detect the proliferation level of cells in four groups: the control group, FH535 (15 μM) group, NAM (50 mM) + FH535 (15 μM) group, REV (100 μM) + FH535 (15 μM) group. A. At the next day, the cells were fixed and immunostained for BrdU (red) and with DAPI (blue) then merged the two pictures of the same field. The scale bar is 100 μm. B. The total numbers of cells (DAPI-staining cells) per field in the four groups. C. BrdU-positive rate of C2C12 cells was analyzed. Each value represents the mean ± standard error of the mean of triplicate determinations from three independent cell preparations. *P<0.05, **P<0.01, ***P<0.001 vs the value of the control; n=3; error bars ± standard error of means. Statistical analysis was conducted using one-way ANOVA. Original magnification is ×200. Oroxin A, an active component isolated from the herb Oroxylum indicum (L.) Kurz, activates PPARγ and inhibits α-glucosidase, exerting antioxidant activity. Gypenoside XLIX, a naturally occurring gynosaponin, is a selective peroxisome proliferator-activated receptor (PPAR)-alpha activator. WY 14643 (Pirinixic Acid) is a potent peroxisome proliferator and activator of PPARα with EC50 of 1.5 μM. (A) Acot1 mRNA following adenovirus treatments and 0.1% Wy-14643 supplementation (n=7-9). (B) H&E staining shows that Wy-14643 reduced and normalized lipid droplet accumulation in the Acot1 knockdown treatment group. Gemfibrozil is an activator of peroxisome proliferator-activated receptor-alpha (PPARα), used for the treatment of hypercholesterolemia and hypertriglyceridemia. Phytol, a diterpene alcohol from chlorophyll widely used as a food additive and in medicinal fields, shows antinociceptive and antioxidant activities as well as anti-inflammatory and antiallergic effects. It is a specific activator of PPARα. Palmitoylethanolamide(PEA) is an endogenous fatty acid amide and selectively activates PPAR-α in vitro with an EC50 value of 3.1±0.4 μM. GW9662 is a selective PPAR antagonist for PPARγ with IC50 of 3.3 nM in a cell-free assay, with at least 10- to 600-fold functional selectivity in cells with PPARγ versus PPARα and PPARδ. Primary microglia (G) were pretreated with JuA at indicated concentrations with or without GW9662 (2 μM) for 18 h, and then incubated with 2 mg/mL Aβ42 in the presence of vehicle (DMSO) or drug for an additional 24 h. The intracellular Aβ42 levels were measured using ELISA. 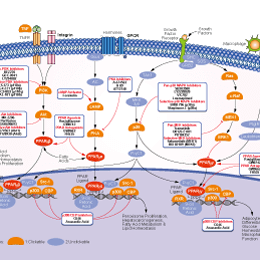 GSK0660 is a potent PPARβ/δ antagonist with a pIC50 of 6.8 (binding assay IC50 = 155 nM; antagonist assay IC50 = 300 nM) and is nearly inactive on PPARα and PPARγ with IC50s above approximately 10 μM. GSK3787 is as a selective and irreversible antagonist of PPARδ with pIC50 of 6.6, with no measurable affinity for hPPARα or hPPARγ. PPARβ/δ activation protects against corticosterone-induced astrocyte damage. (a) Astrocytes treated with Cort at concentrations of 1, 10, and 100 μM( n = 4; F = 329.412 > F0.01 (3, 12); **P < 0.01 vs. Con group); (b) MTT assay performed 24 hours after treatment with Cort (10 μM) and GW (0.1, 1, and 10 μM) (n = 5; F = 7.402 > F 0.01 (4, 20); **P < 0.01 vs. Con group; #P < 0.05 vs. Cort. group); (c) MTT assay performed after 24 hours of treatment with Cort (10 μM), GW (10 μM), and GSK (10 μM) (n = 4; F = 42.431 > F0.01 (3, 12); **P < 0.01 vs. Con group; ##P < 0.01 vs. Cort group; ††P < 0.01 vs. GW group); (d) MTT assay performed 24 hours after treatment with GSK (0.1, 1, and 10 μM) (n = 4; F = 1.659 < F0.01 (3, 12); P > 0.05 vs. Con group); (e) PPARβ/δ expression levels measured by RT-qPCR (n = 4; F = 27.018 > F0.01 (3, 12); **P < 0.01 vs. Con group; #P < 0.05 vs. Cort group; †P < 0.05 vs. GW group); (f) PPARβ/δ expression levels measured by Western blot (n = 4; F = 34.723 > F0.01 (3, 12); **P < 0.01vs. Con group; ##P < 0.01 vs. Cort group; †P < 0.05 vs. GW group). Groups were compared using 1-way ANOVA with post hoc Tukey’s multiple comparisons test. Each data point represents the mean ± SEM. Con, Control; Cort, Corticosterone; GW, GW0742; GSK, GSK3787. Rosiglitazone, a member of the thiazolidinedione class of antihyperglycaemic agents, is a high-affinity selective agonist of the peroxisome proliferator-activated receptor-γ with IC50 of 42 nM. Total and phosphorylated Akt were detected by western blot in protein lysates of liver, inguinal WAT and gastrocnemius muscle from mice that were treated with an insulin bolus after an overnight fast. Rosiglitazone is a potent antihyperglycemic agent and a potent thiazolidinedione insulin sensitizer with IC50 of 12, 4 and 9 nM for rat, 3T3-L1 and human adipocytes, respectively. Rosiglitazone is a pure ligand of PPAR-gamma, and has no PPAR-alpha-binding action. Pioglitazone is a selective peroxisome proliferator-activated receptor-gamma (PPARγ) agonist, used to treat diabetes; A weak activator for full-length hPPARα, but not full-length hPPARδ. Choline fenofibrate is a newly developed choline salt of fenofibric acid, a synthetic phenoxy-isobutyric acid derivate with antihyperlipidemic activity that acts as an PPARα agonist. Lanifibranor (IVA-337) is a moderately potent and well balanced pan PPAR agonist with EC50 values of 1537 nM, 866 nM and 206 nM for hPPARα, hPPARδ and hPPARγ, respectively. Pseudoginsenoside F11, a natural product found in American ginseng but not in Asian ginseng, is a novel partial PPARγ agonist. GW501516 is a synthetic PPARδ-specific agonist that displays high affinity for PPARδ (Ki=1.1 nM) with > 1000 fold selectivity over PPARα and PPARγ. GW0742 is a potent and highly selective PPARβ/δ agonist, with IC50 of 1 nM, with 1000-fold selectivity over hPPARα and hPPARγ. Ciprofibrate is a peroxisome proliferator-activated receptor agonist. Bezafibrate is the first clinically tested dual and pan-PPAR co-agonism. Clofibric acid is a PPARα agonist and hypolipidemic agent. Fenofibrate (Tricor, Trilipix) is a compound of the fibrate class and fibric acid derivative. E. The mTOR-lipin1-SREBP1 pathway in the liver of the Rab8af/f and Rab8a-mKO female mice gavaged with fenofibrate (25 mg/kg) or vehicle (H2O) for 8 days. F. mRNA expression of key genes in lipid metabolism in the liver of the Rab8af/f and Rab8a-mKO female mice gavaged with fenofibrate or vehicle for 8 days. n = 4-6. Statistical analyses were carried out using two-way ANOVA. * indicates p <0.05. n.s., not significant. Glabridin, one of the active phytochemicals in licorice extract, binds to and activates the ligand binding domain of PPARγ, as well as the full length receptor. It is also a GABAA receptor positive modulator promoting fatty acid oxidation and improving learning and memory. Troglitazone is a potent agonist for the peroxisome proliferator-activated receptor-(PPAR) that is a ligand activated transcription factor regulating cell differentiation and growth. Bavachinin is a novel natural pan-PPAR agonist from the fruit of the traditional Chinese glucose-lowering herb malaytea scurfpea. It shows stronger activities with PPAR-γ than with PPAR-α and PPAR-β/δ (EC50 = 0.74 μmol/l, 4.00 μmol/l and 8.07 μmol/l in 293T cells, respectively). Elafibranor is an agonist of the peroxisome proliferator-activated receptor-α(PPAR-alpha) and peroxisome proliferator-activated receptor-δ(PPAR-δ). It improves insulin sensitivity, glucose homeostasis, and lipid metabolism and reduces inflammation. Harmine is an alkaloid of the β-carboline family that regulates PPARγ expression through inhibition of the Wnt signaling pathway. It also selectively binds to MAO-A and reversibly inhibits monoamine oxidase A (MAO-A) but not the variant MAO-B.